MSI launches a brand new line-up of comprehensive gaming products at CES 2107. Featuring the latest Intel 7th generation CPUs, chipsets and NVIDIA GeForce GTX 10 GPUs, MSI affirms its position at the head of the high-end gaming market, bringing gamers all over the world the latest and greatest technologies. Providing a statement of excellence, the exclusive logo which consists of MSI, Intel® and NVIDIA® is shown on all cutting-edge MSI Gaming rigs. “MSI has been dedicated to the field of gaming and is highly acclaimed by gamers and eSports teams worldwide. It is a great and special moment to launch these Gaming products featuring the latest Intel® and NVIDIA® platforms; which combine into another new generation of products that will reach new heights. The logo on our gaming products, in one word, symbolises our commitment and guarantee for extreme performance and Gaming experience”, said Eric Kuo, MSI Vice President of Global Sales & Marketing. Blending perfectly with the Gaming theme at the MSI booth, visitors can venture into the VR zone to experience the revolutionary sound enhancement and smooth virtual reality world by Nahimic and HTC VIVE. Featuring innovative functions and advanced audio mechanics to achieve a higher level of sound quality in a single click, Nahimic truly brings the immersive VR experience to life. With the Intel 7th generation CPU, these MSI Gaming laptops are expected to increase 15% (non-OC) to 25% (OC) in CPU performance boost. In addition to the new CPU, thanks to NVIDIA® GeForce® GTX1050 Ti & GTX1050 gaming graphics cards, the gaps between laptops and desktops are further shortened to essentially none, delivering the faster and smoother VR experience to all gamers. The arithmetic ability, 4K resolution and multimedia operations are practically keys to all gamers during the fierce gameplays. MSI Gaming laptops GT83VR, GT73VR, GT72VR, GT62VR, GS73VR, GS63VR, GS43VR, GE72VR, GE62VR, GP62VR, GP72VR, GP62MVR, GP72/GP62 and GL72/GL62 series, aligning with Intel® and NVIDIA® new platforms, bring those who desire the better VR experience, 4K video and gaming experience. MSI also enhances the audio experience with ESS SABRE HiFi thecnology which has just passed the certification from Hi-Res Audio. Now, MSI GT83VR, GT73VR, GS73VR, GS63VR and GS43VR gaming laptops are ready to support the finest audio quality through SABRE HiFi DAC to your high-end headsets. MSI does not merely focus on gaming but also VR. 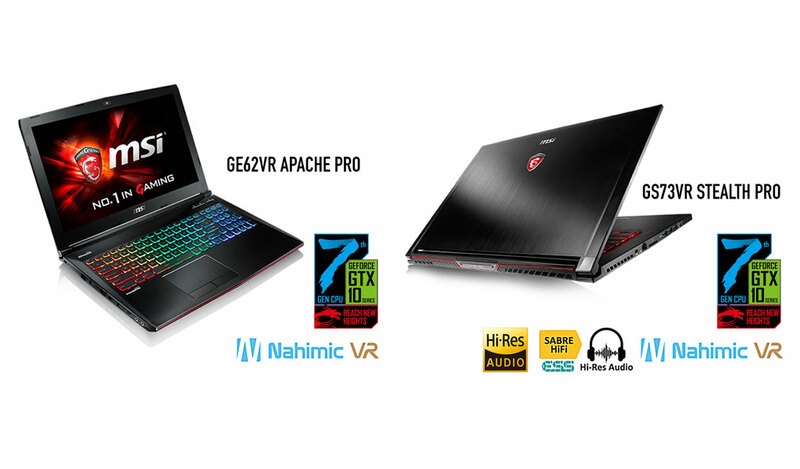 The world’s first Nahimic VR with 7.1 sound is now provided exclusively to some MSI gaming notebooks, driving the audio more advanced to VR. MSI showcases the future of PC gaming technology based on the latest Intel® 7th generation platform. Over 30 models in 4 segments will be displayed during CES 2017. 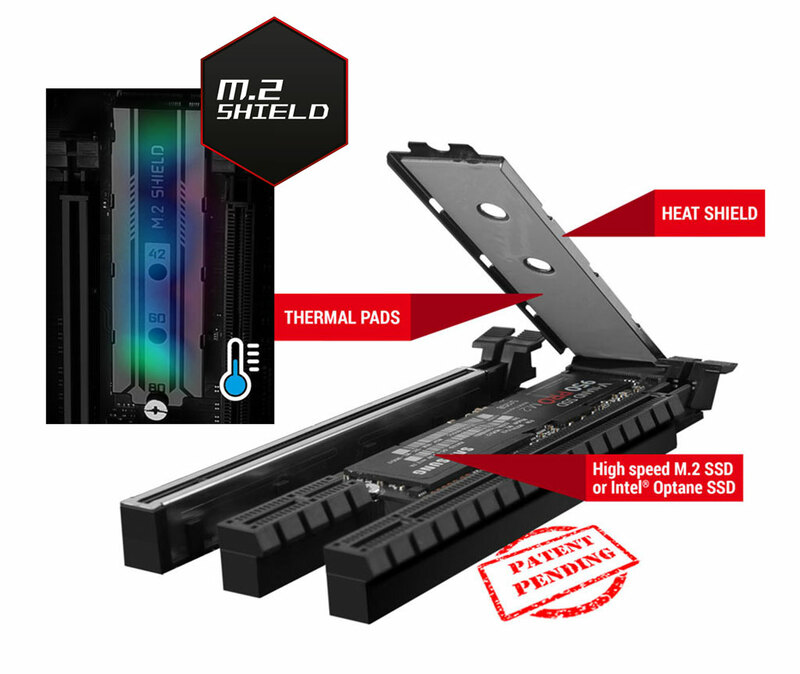 The next generation MSI GAMING motherboards are once again packed with unique features such as M.2 Shield to protect against thermal throttling on super-fast M.2 SSDs and VR Boost to deliver a smooth VR experience with lower latency and less chance of motion sickness. 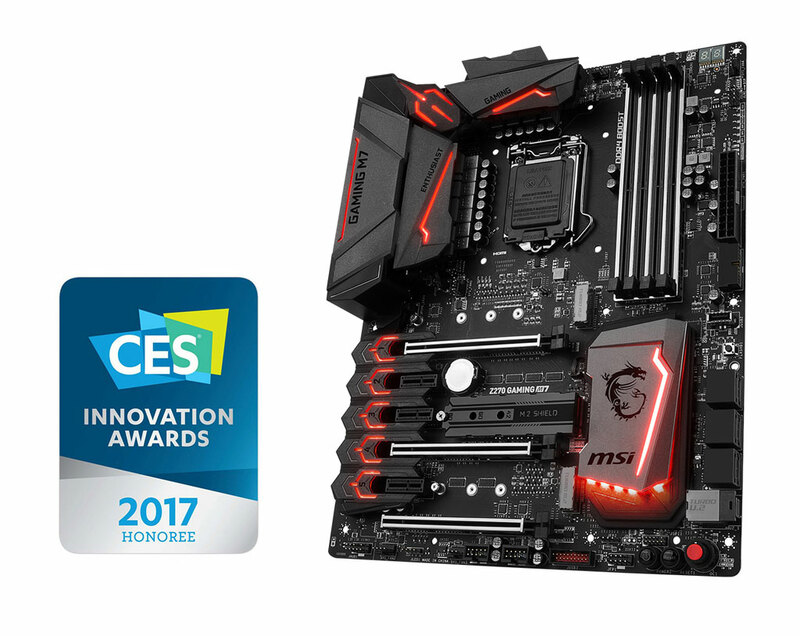 The Z270 GAMING M7 gaming motherboard, winner of CES Innovation Honorees 2017, is an incredibly versatile and complete foundation for a high-end gaming system. Features such as Audio Boost 4 PRO, with Nahimic 2, provides gamers the purest sound experience and a competitive edge on the battlefield. All the heatsinks and covers on the Z270 GAMING M7 motherboard feature RGB Mystic Light, which lets you change the colors and effects with a single click of the mouse. The Z270 GAMING PRO CARBON motherboard is sure to offer gamers a true personalized experience with RGB Mystic Light. Using the Gaming App, gamers can easily control the LEDs by smartphone. Mystic Light Sync ensures any additional LEDs on cases, keyboard or other accessories synchronize colors and effects. The Z270 TOMAHAWK gaming motherboard is built to ensure perfect performance during long gaming sessions with features such as twin Turbo M.2, GAMING LAN and Audio Boost. Unmatched in performance and extraordinary in design, the Aegis Series are at the top of MSI’s gaming desktop line-up. Built on the legacy of the first Nightblade gaming desktop series, the new Nightblades feature both an updated exterior and interior design. The Trident series has made its mark as the world’s smallest VR Ready PC to date. Now upgraded with the new Intel® 7th generation CPU, Trident 3 is the pinnacle of small form factor, yet high performance PC gaming. Spearheaded by MSI’s renowned GAMING series, the GeForce GTX 1080 GAMING Z & X 8G are proudly on display as the ultimate gaming graphics card equipped with the Twin Frozr VI. The GeForce® GTX 1070 Quick Silver 8G is sure to add some ice-cold class to the mix. Standing tall amongst all of this beastly performance is the exquisite limited edition MSI GeForce® GTX 1080 30th Anniversary with unique custom designed EK water block. Borrowing some of the best technologies from the award-winning TWIN FROZR VI cooler, Core Frozr is the best choice for gamers looking for a complete MSI style setup with top-notch acoustic performance. For gamers looking to gain more graphics power while staying with their current laptop, MSI GUS (Graphics Upgrade Solution) is the answer to elevate the graphics performance to the highest level. 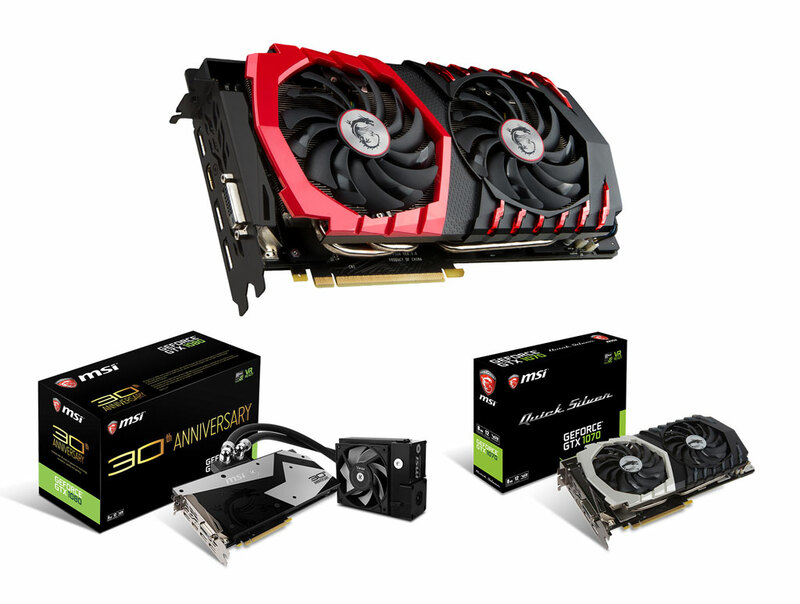 Using a Thunderbolt interface, both latest generation NVIDIA® GeForce® and AMD® Radeon™ graphics cards are supported. Look closely at the 2017 MSI CES booth and you will find some brand new Gaming Gear.